Based out of the Chicago metropolitan area, P2P has existed since 1984. Vinyl releases "Person to Person" Starving artist records - 1984 and "Class of '85" Sharkfin records. Currently we are a Classic Rock Cover band performing the music of Journey, Bon Jovi, Styx, Kansas, Boston, REO and more. P2P has played hundreds of Community Outdoor Festivals, Clubs and Private events Headlining and supporting such acts as Loverboy, Foghat, Molly Hachet, Ides of March, Starship and more. The band is composed of veteran talented players from all over the Chicago area. Person to Person is sure to make your upcoming event a huge success. He has been a low end fixture for years. From the Silhouettes, Jerico, The Hounds, Paul Bogush Band, The John Hunter Band, Joe's Garage Band (sorry made that one up), The Griff Band, P2P all the way to Emotion (featuring the keyboard player from Aretha Franklin) he has appeared on the largest venues in the Country. On tour with The Babys, Journey, REO Speedwagon, Foghat, Golden Earring, Black Sabbath, Juda Priest and Richie Blackmore to mention a few. Also appeared on albums with Paul Bogush (featuring Larry Carlton) The Hounds, The John Hunter Band, Don Griffin, Emotion, Hometown and Skatetown USA (can I please forget this one). Biggest record label……Columbia Records. And above all…performing on American Bandstand! So whether by pick, thump, finger style or now keys, he still enjoys performing. 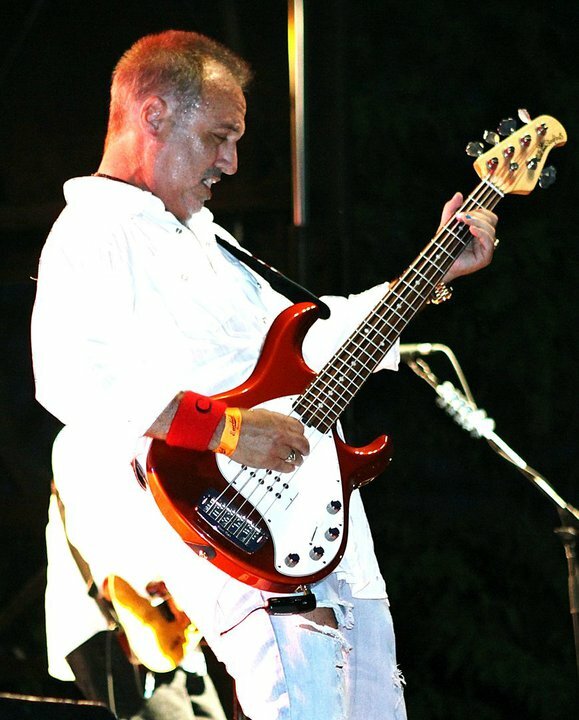 Don toured with REDROCK from 1976 - 1979, played with TJ Slayer and Casanova in the early 80's and released a record called "PERSON TO PERSON" in 1984 and wrote and produced "Don't Say Goodbye" on the Class of 85 record. Don also played with Infinity from 1997-2001 playing 100's of fests and clubs. Don has also played with the "Billy Childers Band" (ITUNES) playing Country Thunder, winning Chicago's Next Big Star and opening for Kenny Chesney at Soldier Field in 2008 for the Poets and Pirates Tour with Keith Urban. Don reformed P2P in 2001 and has been the leader of the band through 100's of performances of area festivals, clubs, corporate events and weddings as PERSON TO PERSON. Don is a gifted guitar player and is passionate about music. This healthy obsession is the drive behind P2P. Jody Jones has been the back beat for bands in the Chicago area such as Horace Monster, Greased Lightning, Sister Envy, Emotion, Voodoo Moon and 90 West for the last 30 plus years. He is capable of great lead and back up vocals. Most people don't understand the dynamics of a rhythm section. You are only as good as your drummer. He can play and sing with authority, while keeping a tight groove perfectly "in the pocket"'. He has a natural gift for meter and makes it look almost too easy. He locks in with Joe Cuttone on bass, to create a powerful stage and sound presence to the rhythm section. Jody also sings lead vocals on few songs during the set and has been with P2P since 2007. Steve takes Person to Person to "the next level" with his keyboard technique and incredible vocal ability. Webster has his picture next to the word "versatile". His extensive experience and attention to musical details helps to keep crowds at the edge of their seats. There isn't a song he doesn't know. It would be easier to name the bands in the Chicago area he wasn't a member of. If you didn't see him in one of his main bands, you most likely saw him as a seamless "stand in" for a night or two with a whole bunch of bands. He has been a main fixture with The P2P Band since 2003. Dawn has a strong tenor voice suitable for classic rock. Her dynamic range is perfect for our style. Look for new material covering some country rock classics as well. Don formed Person to Person in 1984 after previously touring and playing in the bands like REDROCK, TJ SLayer and Casanova in the late 70's and early 80's. He wrote, produced and released on Starving artist records "PERSON TO PERSON" in 1984 and on Shark Fin records, "ClASS OF '85". It featured players/singers from Casanova, Eric Wedow (centerfold) and Tracy Zebar (David Shankle Group) Dale Hehr, Rick Koskela and Manny Alvarez. Don recruited Kevin Willison (Jamiliya, Infinity, and Beyond), Bob Biagi (Infinity), Lou Paulson, Tony Napolitano (Jamiliya) Glenn Zelynsky (violin) to launch the band to support the record. They had great success through 1988 as an original band/Kansas Tribute. They disbanded and Kevin went to Jamiliya and Bob formed Infinity. Later Kevin and Jim left and formed ARRA. After a break to start a family, Don returned to the Chicago music scene with former band members of P2P and joined up with Infinity in 1997. Don played extensively for the next 4 years with Infinity. Don's Film industry work dictated a thinner concert schedule and he reformed P2P in 2002 with former bandmate Tony Napolitano on drums and Tyler Holcomb (Decades, Hairbangers Ball, Arra, High Infidelity) on bass. The band shifted gears in 2005 and added members Sal Saccomano and Steve Reimer with Paul Martin (Hairbangers Ball) on vocals. Later substituting Greg Ashby(Kashmir) on vocals, Joe Cuttone on bass and Jody Jones on drums. Greg left to continue teaching in Indiana and is still singing at small venues around Indiana. Len Deptula (Back Stage Pass/Epic) replaced Greg and was with us until 2012. Maria Incandela (Fire and Ice) was with us as Minefield Ballet for short while and Kevin Ward joined up for 2017. Dawn Caley is now the current singer for 2018. 27w150 Roosevelt rd., Winfield IL. 1712 W. WISE Road , schaumburg IL. BAR 145 34 S. Main St.